Last October 1st, took place the Vieilles Charrues in New York for their 25th anniversay. 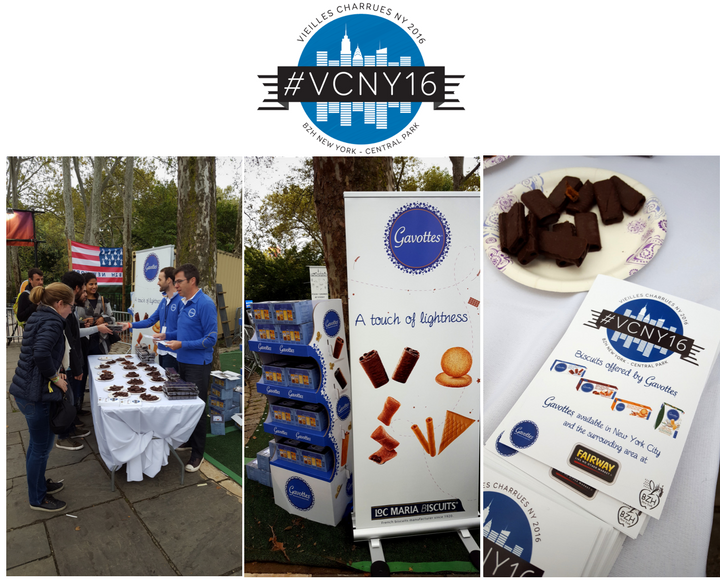 We were an official partner of this event and were there in Central Park ! The program includes, concerts and merrymakings highlighting Brittany right in Central Park ! 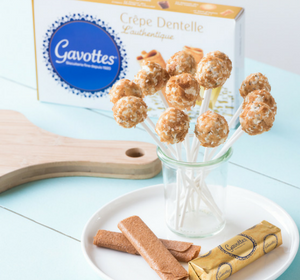 We organised a Crêpes Dentelle tasting; French people in New York and Americans who were attending the event could therefore discover our brand Gavottes® and our Crêpes Dentelle. A real success with some products that pleased more and more across the Atlantic. What could be more authentic than someone getting a little forgetful in the kitchen? Just a pancake left a little too long on the stove by Marie-Catherine Cornic in Quimper, in 1893. So the good lady decided to fold it, roll it up, and pop it in her mouth… And the little crêpe that had seemed ruined turned out to be lighter and crispier than ever! 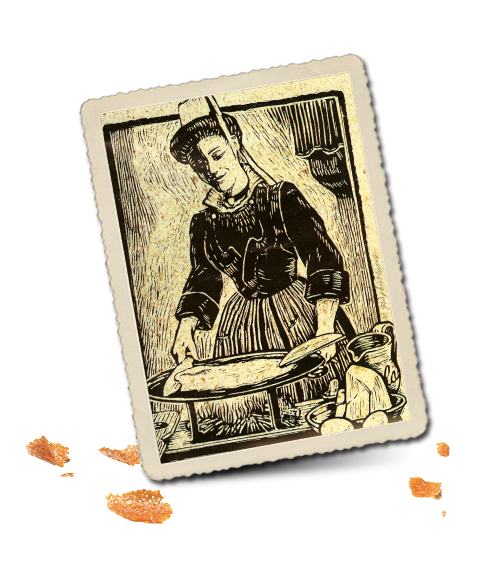 This was the origin of the crispy Brittany crêpe, and its authenticity has been jealously preserved ever since. In making authentic Gavottes crispy crêpes, the key ingredients used by our pastry cooks are wheat flour, sugar and butter. Preference goes to raw materials produced by French farmers. Our crispy Brittany crêpes contain no food colourings, preservatives, palm oil or GMOs. Gavottes products exist to give pleasure, day by day. 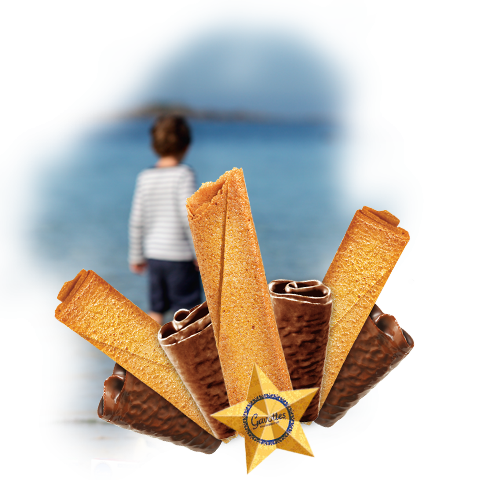 You pop this little packet of biscuits in your bag – biscuits you would love to keep, secretly, jealously, all to yourself… And the moment you put them on the table, they attract greedy looks from all and sundry, irresistible in their golden glory. A crunchiness you just have to share with friends. Gavottes are no different from those who enjoy them delightful and wicked. Let’s get our teeth into this delicate biscuit! Yes, Gavottes crispy Brittany crêpes have always had a melt-in-the-mouth crunchiness. From the very first one left on the stove by Marie-Catherine Cornic to its modern counterpart, always the same sensation. An explosion in the mouth, thanks to the famous eight-fold rolling process. Famous because it is unique in the world, a jealously kept secret. Gavottes surely deserve a bit of mystery ! Imagine the buzz of activity in this Quimper kitchen. Distracted by a multiplicity of tasks, our valiant pastry-cook leaves one of her crêpes on the stove. And what is she to do, at a time when nothing must be wasted? Marie-Catherine Cornic rolls it up and pops it in her mouth. She experiences a wonderful new crunchy sensation, a golden lightness… the crispy Brittany crêpe is born! 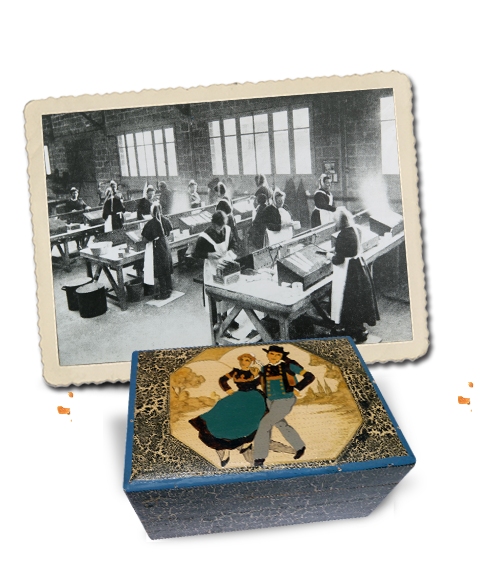 Mme Cornic’s revolutionary ‘method’ is now imitated by many pastry cooks in the new Gavottes® biscuit factory in the Loc Maria district. They roll each crispy crêpe, by hand, over and over eight times. 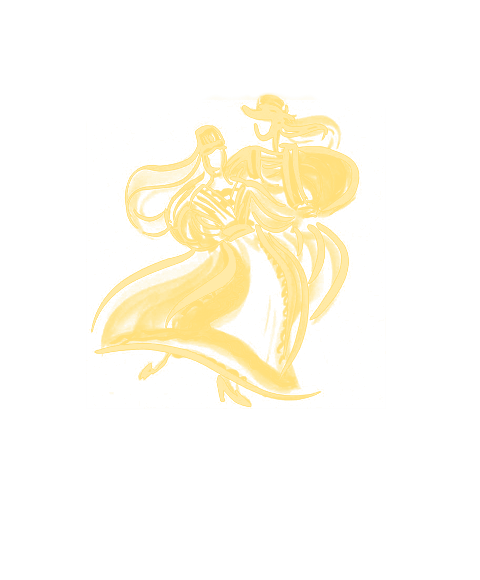 In less time than it takes to dance an eight-step gavotte! The popularity of the crispy crêpe recipe is such that the deft fingers of our pastry cooks can no longer keep up with demand. The process is therefore mechanised, thanks to a unique rolling technique. A pastry cook can now produce 1,500 crispy crêpes in one hour, a big advance on 100! 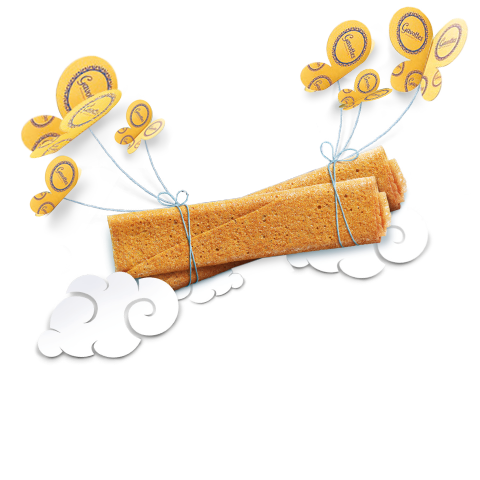 Our delicate crispy Brittany crêpes are appreciated - and therefore shipped - all over the world. As a result, the old building in the Loc Maria district of Quimper becomes too cramped. So the operation moves to Dinan, to a new factory with 4,500 m2 of floor space. 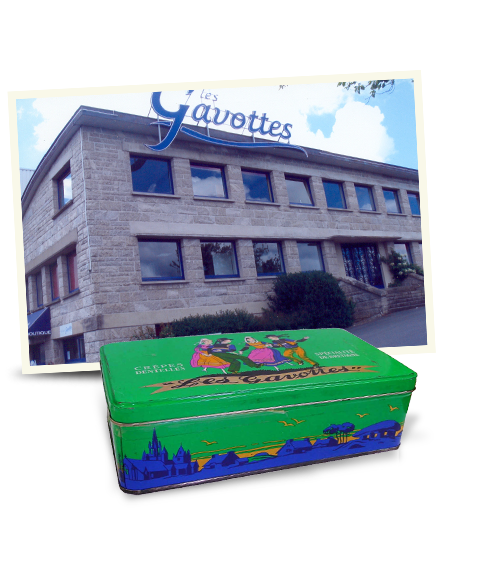 Gavottes® does not mind, as long as they remain in Brittany! As the 1970s progress, Gavottes® becomes even more tempting. 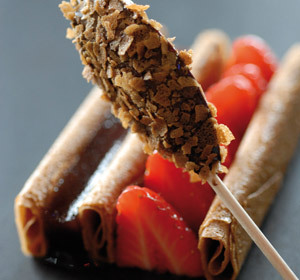 Our delicate crispy Brittany crêpes are determined to keep up with the times, appearing in pleasurable new guises. 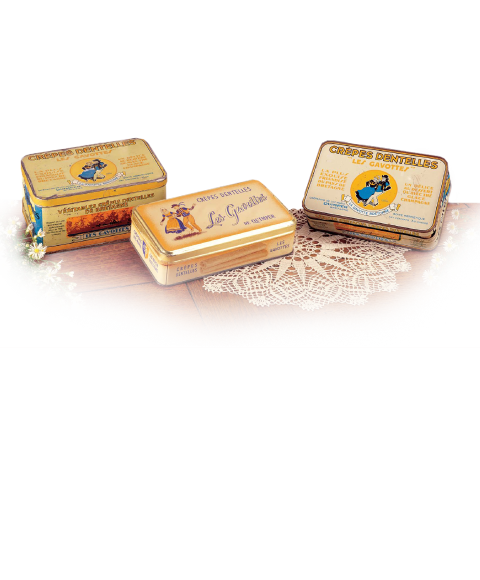 They come in rich dark and milk chocolate coatings, but without losing anything of their elegance and crispiness! What an eventful life! 90 already, so Happy Birthday, Gavottes® ! You are now enjoyed in more than 40 countries. 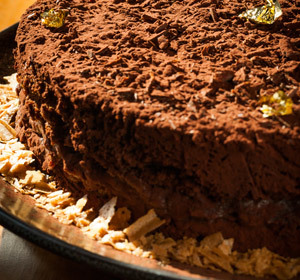 Light, crispy, deliciously golden, the birthday cake is right to hand, and lights up the Dinan’s ramparts. Marie-Catherine Cornic and her sister pastry cooks of all those years ago would be overwhelmed and delighted by such success. 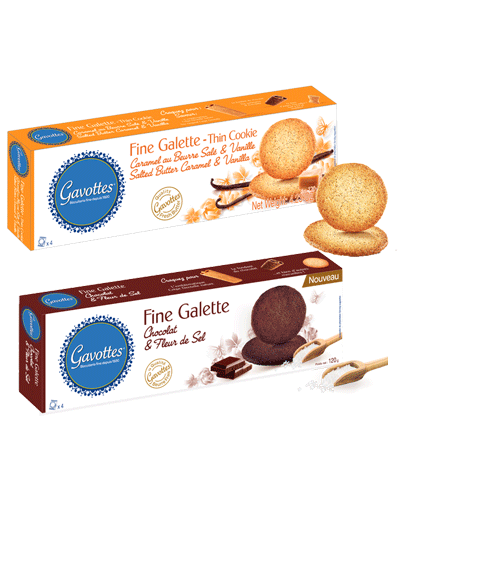 Now famous for its crispy crêpes, Gavottes® offers a new range with thin cookies still as crispy as the others. Salted butter caramel and vanilla from Madagascar or salted chocolate, you will for this new range ! 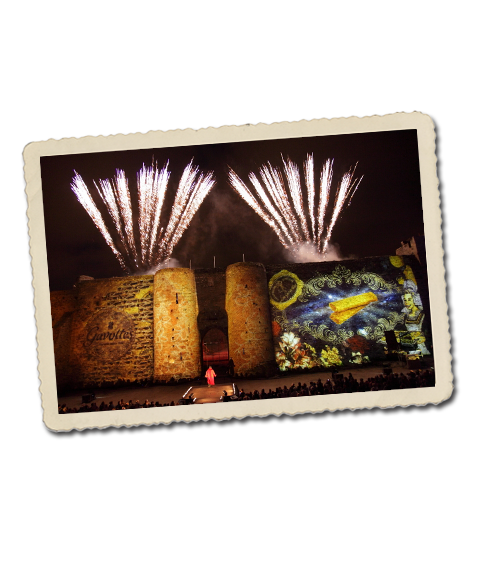 Gavottes® is named Entreprise du Patrimoine Vivant (Living Heritage Company) in 2013. A unique label awarded by the French State in recognition of the traditional craftsmanship and industrial excellence of certain companies. Gavottes® launches in October 2014 its crispy spread. The smoothness of a chocolated spread with the unique crunch of crispy crêpes. 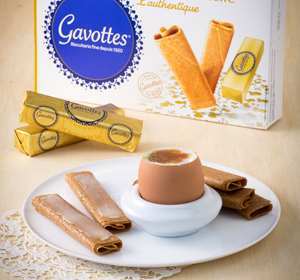 Gavottes® launches its salted range with filled crêpes with original flavours. Enjoy your aperitif with friends and family ! The crispness of the Crispy Crepes mixed with the smoothness of the chocolate for a sensation of absolute happiness. 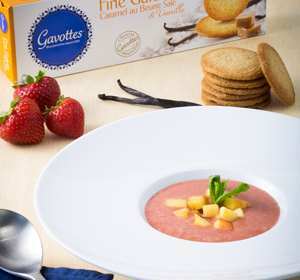 Gavottes® in two or three steps… delicious and festive ! Savour the look of your crêpe dentelle delicately coated with chocolate then… bite into it, of course ! You won't be able to resist the subtle blend of crunch and chocolate ! An alluring duo, presented in a trendy, sophisticated box. To be enjoyed, with your nearest and dearest, or given as a present. 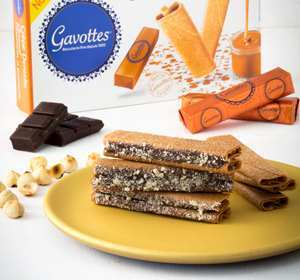 Gavottes® is coming to the snacking section ! Enjoy some crunchy crepes filled with The Laughing Cow® Cheese with friends and family ! 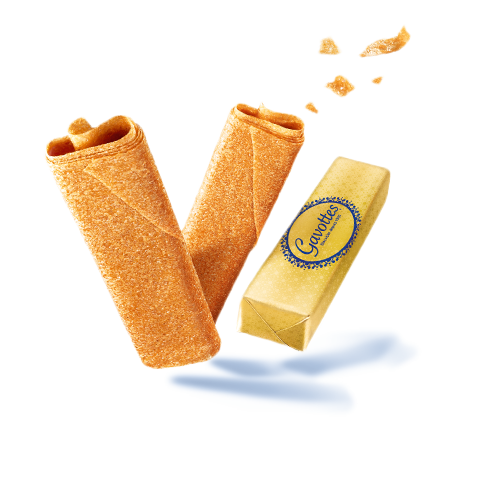 Gavottes® in two or three steps... Unfold the golden wrapping. 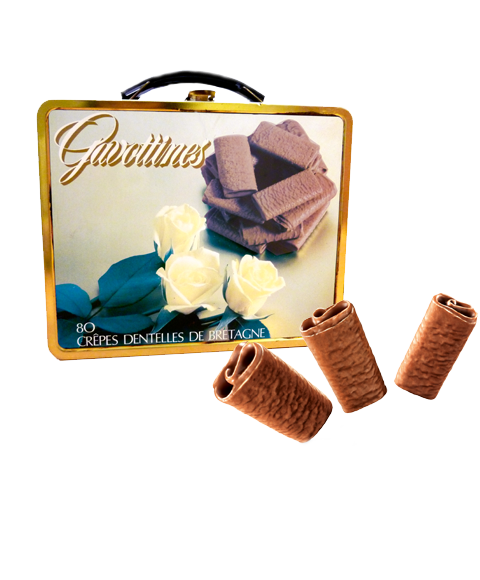 Unwind the dentelle and take in its gentle aroma. Fell the dentelle break into flakes against your tongue. But make sure you don't lose any crumbs, and if you do ... devour them ! Gavottes® in two or three steps... Take the time for a luxury break. Savour the look of your crêpe dentelle delicately coated in milk chocolate then... bite into it, of course ! Savour the look of your crêpe dentelle delicately coated in dark chocolate then... bite into it, of course ! A thin, golden biscuit just waiting for you to take a crispy bite and discover the refined flavour of Bourbon vanilla, and the subtle sweetness of salted butter caramel. A little gourmet snack to be savoured down to the very last crumb! Take the time for a luxury break. Savour the lookof your crepe dentelle delicately coated in milk chocolate then... bite into it, of course ! You won't be able to resist the subtle blend of crunch, caramel and chocolate ! Gavottes® in two or three steps... Imagine a wafer, thin pancake... and then adding a caramel topping to finish it off ? Mmmm bite into it and rediscover this great classic. When a crunchy rolled biscuit and thin fan-shaped wafer join the fun, an irresistible treat is definitely in store! 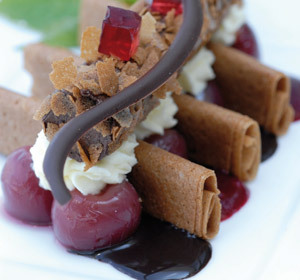 Dessert is no longer about choosing, but letting your imagination run free! Give into these little crispy pockets and let yourself be pleasently suprised by their creamy cocoa hazelnut center. The perfect treat to enjoy, or furtively share, like a little gourmet secret. Give into these little crispy pockets and let yourself be pleasantly surprised by their creamy caramel center. The perfect treat to enjoy, or furtively share, like a little gourmet secret. A holiday atmosphere is blowing on this timeless metal box collection in seaside colours. this ready-to-crunch collection offers a mouth-watering selection of crispy crêpes left plain or covered with milk or dark chocolate. Unwrap, share, taste and have fun ! 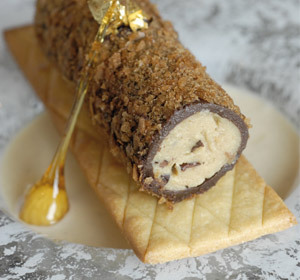 Let the golden papers slip through your fingers and play out their game of gourmet seduction. A crunchalicious trio to enjoy with friends or give as a gift. Savour the look of your crêpe dentelle delicately coated in milk chocolate then... bite into it, of course! You won't be able to resist the subtle blend of crunch and chocolate! 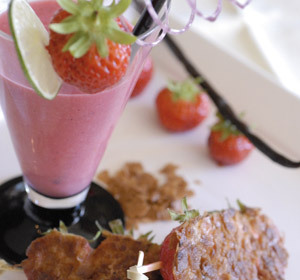 Enjoy some crunchy crêpes filled with original flavours for your aperitif with friends and family ! Finely mix the cookies and add the melted butter. Line this mixture in the bottom of a rectangular pie pan. Cover with a glass. Refrigerate while waiting for the rest. In a blender bowl or with a plunging blender, mix the sweetened condensed milk, unsweetened condensed milk, cream, lime juice, lime zest and mint leaves. Pour the mixture over the bottom of the cookie pie. Smooth with a spatula. Bake 8 minutes at 180° traditional heat. Cool on a rack and refrigerate for several hours or even overnight. In a container, combine the dry ingredients: flour, baking powder, brown sugar. Apart from this, quickly mix egg yolks and almond milk. Pour this mixture into the dry ingredients, and mix well to obtain a smooth dough. Beat the egg whites in snow with the pinch of salt and add to the previous dough. Butter a pan and heat it to medium heat. Pour a small ladle of dough into the pan. When the small bubbles begin to burst on the surface, flip the pancake with a spatula, cook for a few minutes, then place on a plate. Repeat the process until the dough is gone. 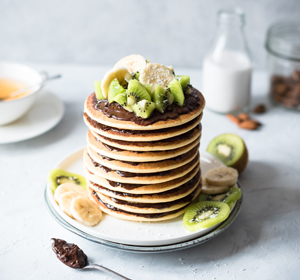 Spread each pancake with cocoa or cocoa-hazelnut spread according to your taste, and pile on a plate. Serve with seasonal fruit cut into wedges. Préchauffer le four à 175° chaleur traditionnelle. 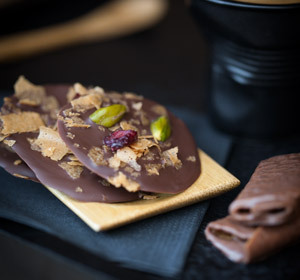 Dans un large récipient, mélanger les flocons d’avoine, les crêpes dentelle chocolat au lait émiettées, les amandes hachées, les cranberries hachées et la noix de coco râpée. Verser le sirop d’agave et l’huile de coco fondue. En utilisant un emporte-pièce rectangle ou un moule à mini cakes, bien tasser la préparation pour façonner les barres de céréales. Enfourner la plaque de cuisson pendant 15 minutes. Laisser refroidir sur grille puis réfrigérer pour durcissement. Faire fondre le chocolat au lait au micro-ondes et napper la partie inférieure des barres en les trempant dans le chocolat. Faire durcir au réfrigérateur. Se conserve plusieurs jours dans une boite hermétique. Preheat the oven to 175° traditional heat. In a large container, combine the oats, crumbled milk chocolate Crispy Crêpes, chopped almonds, chopped cranberries and grated coconut. Pour the agave syrup and melted coconut oil. 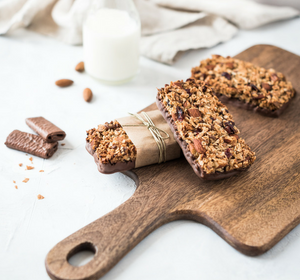 Using a rectangular cookie cutter or a mini cake pan, pack the mixture well to shape the cereal bars. Bake the baking sheet for 15 minutes. Let cool on rack and refrigerate for hardening. Melt the milk chocolate in the microwave and coat the bottom of the bars with the chocolate. Harden in the refrigerator. Keeps several days in an airtight box. Place the broken-up chocolate in a pan. Add the diced butter and allow to melt over a very low heat for 2 to 4 mins. Off the heat, stir the chocolate and butter and add the egg yolks then the icing sugar. Mix again. Allow to cool, then add 8 crumbled Gavottes before the mixture solidifies. Crumble the remaining Gavottes onto a plate. 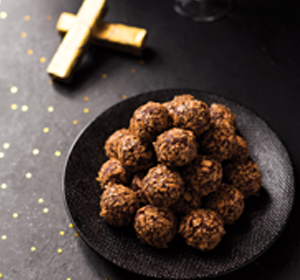 Make the dough into truffles in the palms on the hands or with a teaspoon and roll in the crumbled Gavottes. Pre-heat the oven to 180°C (th.6). Butter a baking tray and cover with baking paper. Separate the egg whites from the yolks. In one bowl, blend the egg yolks with the sugar. In a second, whip up the egg whites with a pinch of salt. Sieve and fold the flour into the first bowl, mix, then add in the melted butter and the whisedegg whites. Mix again. Spread the resulting mixture on the buttered baking tray. Smooth with a spatula. Bake in the over for 10 minutes. Melt the praline and dark chocolate in a pan over a bain-marie. Pour the melted chocolate over the crumbled Gavottes, mix well. Spread over the biscuit and leave to set in the refregirator. Make a syrup with sugar and water. Cut up the chocolate and melt it in a pan over a bain-marie. Separate the egg whites from the yolks. Place the yolks in a bowl and beat them with the sugar syrup. Pour the melted chocolate in with the egg yolks, mix thoroughly and allow to cool. 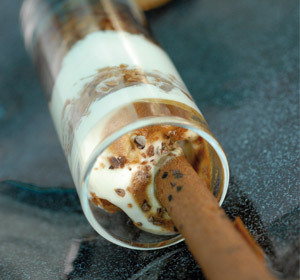 Whisk the cream into a Chantilly and blend it with the chocolate. 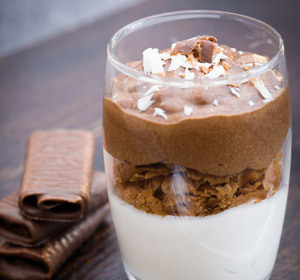 Spread the mousse on top of the Gavottes® crunch. Smooth the surface. Place back in the fridge. Cut the resulting cake into 6 or 9 individual dessert slices. 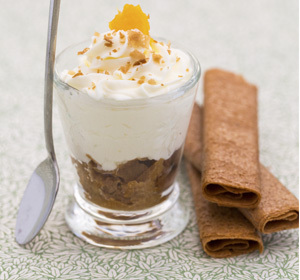 Suggestion: try spinkling some crumbled Gavottes® over the dessert slices! Wash and hull the strawberries. Put them in a blender and add the orange juice, blend. Add the mint leaves (or the mint syrup), blend again. Add the broken up pieces of cookie, then blend for the final time. Check the consistency of the gazpacho. If the mix is too runny, add some more cookies; if it is too thick, add some orange juice. Peel and cut the nectarines into cubes. Pour the strawberry gazpacho into bowls, add the nectarine cubes and then a pinch of lime zest. In the summer season, bring even more freshness to the dish by adding some watermelon, a subtle taste that goes perfectly with strawberries. Preheat the oven to 200°C (Th. 6/7). In a small pan, heat up the butter until it becomes a brown colour. Put the Gavottes® crunchy chocolate spread in the microwave for about 2 minutes (450 Watts) to soften it. In a bowl, mix the egg whites without emulsifying them. Add the icing sugar, then the sifted flour and baking powder. Mix well. Pour in the browned butter, then add the softened chocolate spread. Mix again. Let the mix rest for at least 2 hours in the fridge. Divide the mix up into Madeleine moulds (do not line with butter if silicone) and put in the oven for 8 to 10 minutes. Take the Madeleines out of the oven. Leave to cool for a few minutes before removing from the mould. Those with a sweet tooth can add a bit of the chocolate spread onto the top of the madeleines. 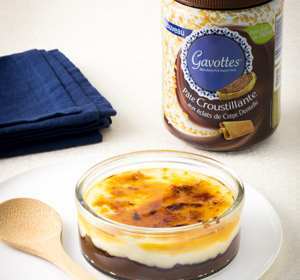 Put one tablespoon of Gavottes® chocolate spread into each individual crème brûlée pot, then place in the fridge for 15 minutes. Preheat the oven to 90°C (Th. 3). In a bowl, mix the egg yolks, caster sugar, milk, and cream together without emulsifying. Divide the mix up into the pots already lined with chocolate spread, then put in the oven for about 35 minutes. When taken out of the oven, the centre should be soft. Leave to cool for 1 hour, then refrigerate for about 2 hours. When ready, switch the grill on, take the crème brûlées out of the fridge and sprinkle brown sugar on top. Put them under a well-heated grill for a few moments until the surface is caramelised. They should be slightly warm on the inside with a soft chocolate spread. It is also possible to caramelise the crèmes brulées with a blowtorch. Preheat the oven to 180°C (Th. 6). 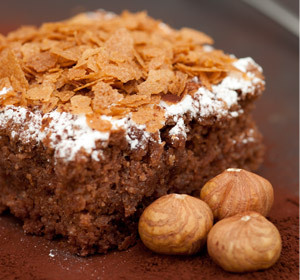 Put the hazelnut powder in a dish and leave to brown in the oven for a few minutes. Leave to cool. Melt the chocolate in the microwave or in a bain-marie. One by one, dip half of the Gavottes® caramel crêpe dentelles into the melted chocolate on one side, then assemble them together with the remaining crêpes. The chocolate should be lukewarm but not too runny so that the two biscuits stick together. Mask the edges with the roasted hazelnut powder. Leave to set at room temperature (below 25°C) for about 2 hours. A generous quantity of chocolate is needed to keep the crêpes together. 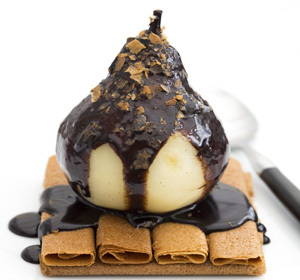 Reuse the rest of the chocolate when preparing another dessert or use as chocolate sauce. Boil water in a pan. At boiling point, gently place the eggs in the water and leave to cook for 3 minutes. Remove the eggs from the water and run them under cold water to stop the cooking process. Place them in egg cups, then crack the top of the egg open. Place one teaspoon of jam in each egg, the put a dash of lime zest on top. Lightly butter the Gavottes® crêpes with soft butter. Peel the apples, cut them into 2cm x 2cm cubes. Stir the butter in a frying pan at medium heat. Add the apple cubes and sauté the cubes so that they colour on all sides. Do not over-cook them: they should remain firm and tender. Split the vanilla pod in two along the length and scrape the seeds out with the tip of a knife. Add half of the seeds to the mix. Once cooked, add the honey and then turn off the heat. In a bowl, mix in the rest of the vanilla seeds to the cream (no sugar!). Put aside. Divide the apples up into the verrines. Put both mixes in the fridge for at least 1 hour. Just before serving, distribute the cream into the verrines on top of the apples. 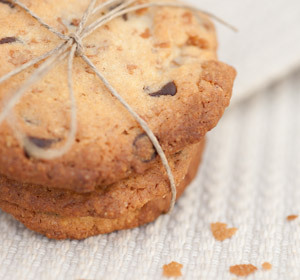 Roughly break up the thin Gavottes® caramel & vanilla salted butter cookies and place on top. Put the fleur de sel, pepper, vinegar and the oils together, mix and put aside. Wash and dry the salad mix. Cut up the cheese into small pieces. Wash and cut the pears lengthwise. 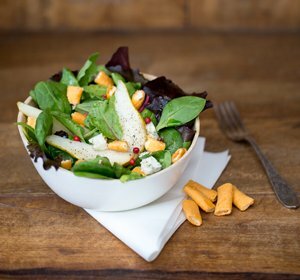 Place the salad mix, the pear strips, the cheese, a few pink peppercorns and the crêpes filled with blue cheese and walnuts onto 4 plates (or bowls). 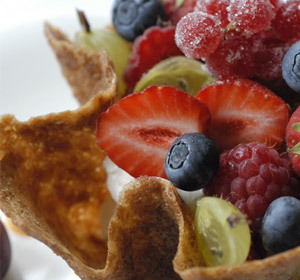 - Put the flour, the crumbled crêpes and the butter in a bowl, mix using fingertips. - Wash, dry and cut the cherry tomatoes in two. - Season with salt and pepper; add the olive oil and the crushed garlic. - Leave to marinate in the fridge for 30 minutes. 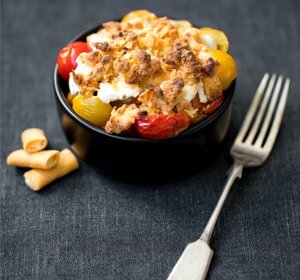 - Place the cherry tomatoes in ramekins, the crumbled goat’s cheese and put the crumble mix on top. - Cook in the oven for 25 minutes at 180°C. Bring the water, vanilla and sugar to the boil. Peel the pears whole, squeeze the lemon over them. Cook the pears in the syrup you have made for 10 minutes. Leave them to cool down. Melt the chocolate with the water and butter in a pan over a bain-marie. Stir with a spatula, until you have a smooth chocolate sauce. If necessary, thin it with the syrup used for cooking the pears. Arrange the Gavottes on plates, as shown in the photograph. Position the pears, pour the chocolate sauce over them and sprinkle with crumbled Gavottes. Suggestion: try using peaches or strawberries instead of pears. For those with a sweet tooth, add a scoop of vanilla ice-cream! Wash and brush the lemon, slice off pieces of the peel (zests) and set aside. 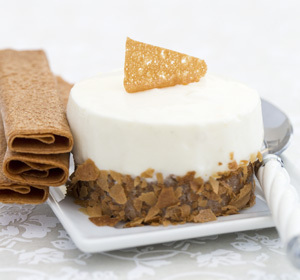 Prepare the cheesecake base: gently using your fingers, mix the crumbled Gavottes and the slightly salted butter in a bowl. Place the mixture in baking rings lined with parchment paper (pastry cutters or, if you do not have any, tart moulds). Refrigerate for 30 minutes. Place the sheets of gelatine in a bowl of cold water. Meanwhile, mix the cream cheese, lemon zests, fromage blanc and sugar in a bowl. Heat some water in a small saucepan. Take it off the heat and add the gelatine, having drained it thoroughly. Dissolve the gelatine in the hot water. Pour it over the cheese mixture. Stir quickly, until you get an even mixture. Pour the cheesecake into the baking rings. Smooth the surface and refrigerate for at least 4 hours. Suggestion: try flavouring your cheesecake with zests of lime, or with vanilla. It is also delicious with caramel made using salt butter! Mix the mascarpone, fromage blanc, essential oil and icing sugar in a bowl. Refrigerate for at least 2 hours. Peel the 4 clementines, removing all the pith. Place the segments in a saucepan with 5 cl of water and 3 tablespoons of cane sugar. Boil for 5 minutes, then leave to cool. Arrange a layer of crumbled Gavottes in the bottom of the verrines, then the citrus cream (squeezed from a piping bag) and the clementines. 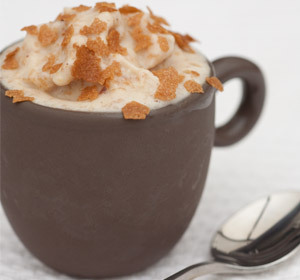 Suggestion: try making a coffee-flavoured cream, rather like tiramisu. If you have not got a piping bag, you can use a freezer bag with a hole in the corner. Place the crumbled Gavottes in a mixing bowl and add the flour, brown sugar and cubed butter. Mix the ingredients with your fingers to obtain a crumbly dough. Pre-heat the oven to 180°C (th.6). Peel and cut up the pears. Lay out the pears and chocolate chips in 4 small oven-proof dishes. Sprinkle with a layer of the Gavottes crumble. Bake for between 20 and 25 minutes. This dessert can be enjoyed hot or cold. Suggestion: try adding a few chopped hazel or pistachio nuts. You can also use red berry fruits and white chocolate for the recipe. 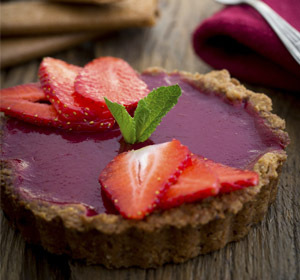 Prepare the short-crust pastry by blending all the ingredients with a food-processor. Allow the dough to rest in the refrigirator. Lay out the short-crust dough in a flan dish. Prick the bottom and sides with a fork, cover with a sheet of baking paper and weigh down with ceramic pastry weights (or dry beans). After 20 minutes, remove the weights and baking paper, and bake for a further 5 minutes, then leave to cool. 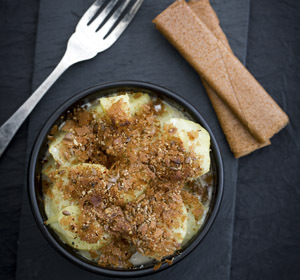 Crumble the Gavottes in a large bowl. Pour the melted chocolate over the crumbled Gavottes, mix-well. Spread the mixture over the piecrust base. Leave to set for 30 minutes in the refrigirator. Break up 140 g of chocolate and melt it with the butter in a pan over a bain-marie. Separate the egg whites from the yolks (clarify). Pour the melted chocolate (after it has cooled) into a bowl and stir in 2 egg yolks. Whisk the 3 egg whites and lightly fold them into the chocolate mixture. 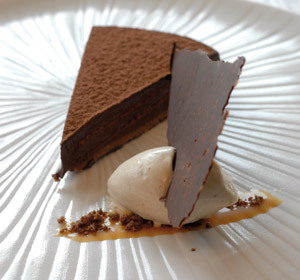 Spread the chocolate mousse over the Gavottes-chocolate layer of the tart. Refrigerate for 2 hours. Just before serving, decorate with chocolate chips. 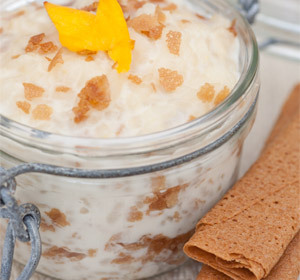 Suggestion: try making your mousse with white chocolate instead of dark, and add some almonds to the Gavottes. 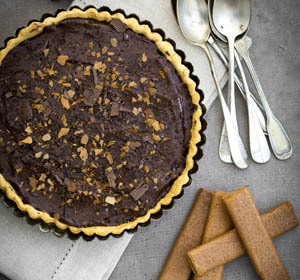 If you are short-of-time, use some ready-prepared pure-butter short-crust pastry. Place the sheets of gelatine in bowl of cold water. Split the vanilla pod open and remove the seeds usiing the point of a knife. Place the cream, sugar and vanilla seeds in a saucepan. Heat the mixture, stirring continuously. Take off the hob and leave to infuse for 5 minutes. Dry the gelatine sheets and add them to the contents of the saucepan, stirring all the time. Pour into verrines and leave to set in the refrigirator. 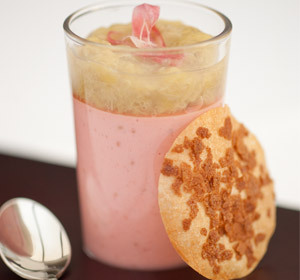 Just before serving, pour the coulis over the panna cotta and sprinkle with the crumbled Gavottes. Suggestion: try making a blood-orange panna cotta, accompanied by a chocolate sauce. Boil a large pan of water, add some rock salt and drop in the potatoes (cook for about 20 minutes, depending on size). Peel the potatoes once they have cooled. Pre-heat the oven to 180°C (th. 6). Skin and chop the onions. Place the crumbled Gavottes on a plate and add the salt, pepper and the sesame seed. Melt the butter in a frying pan, add the onions and fry lightly (do not allow to brown). Lightly butter a gratin dish, lay out a first layer of thinly sliced potatoes, the onions, then a second layer of potatoes. Pour on the single cream and sprinkle with a layer of crumbled Gavottes. Suggestion: try adding some flakes of parmesan cheese to the crumbled Gavottes. Pre-heat the oven to 150°C (th.5). Mix the powdered almonds, flour and crumbled Gavottes in a bowl. In a second bowl, mix the cane sugar and egg yolk until the mixture turns white. Add the melted butter. Stir in the flour-Gavottes mixture. Arrange the resulting mixture in a number of tart moulds, then cover each of them with a piece of baking paper held down by some ceramic pastry weights. Bake for 20 to 25 minutes. After 15 or 20 minutes, remove the pastry wieghts and baking paper and bake for a further 5 minutes. Hull 200 g of strawberries and cut them into small pieces. Mix with 5 cl of water, the lemon juice and the sugar. Pour some cold water into a bowl and add the gelatine sheets. Pour the strawberry coulis into a saucepan and heat. Drain the gelatine sheets and add them to the coulis, having first removed the saucepan from the hob. Stir thoroughly. Pour the coulis into the tart bases. 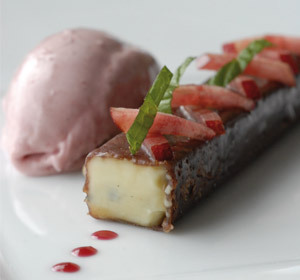 Just before serving, decorate with the remaining strawberries and the mint leaves. 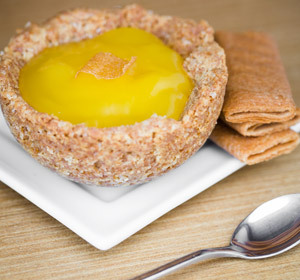 Suggestion: try making these tarts with other fruits: kiwi, raspberry, passion fruit, mango, gooseberry. Place the crumbled crêpes dentelle Gavottes® on a plate and add salt and pepper, the linseed and the chilli powder. Thoroughly mix the cheese, poppy seed and some salt and pepper in a bowl. Form some small balls of fromage frais and refrigerate for 20 minutes. 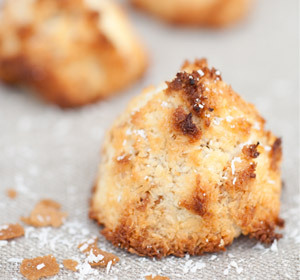 Just before serving, roll the balls of cheese in the crumble you have made with the crêpes dentelle Gavottes®. Suggestion: try serving the cheese balls on cocktail sticks. Split the vanilla pod in two, scrape off the seeds with the blade of a knife. Rinse the rice in cold water. Place in a saucepan and cover with cold water. Bring to the boil and remove from the heat 2 to 3 minutes after the first bubbles appear. Rinse again and drain. Bring the milk to the boil in a large saucepan. Reduce the heat, add the rice, the brown sugar, the vanilla seeds and the vanilla pod. Stirring continuously, dot with butter and continue to cook over a low heat for 30 to 40 minutes (depending on the rice used). The liquid should not be completely absorbed. Wash the peaches, peel them, then halve and cut into cubes. Melt the butter in a frying pan, add the peach cubes, sprinkle with sugar and cook at a moderate heat until caramelised. Serve the rice with the sautéed peaches, sprinkle with the crumbled Gavottes and enjoy! Trim the rhubarb, cut into cubes. Cook the rhubarb, water and sugar over a moderate heat for around 30 minutes, stirring regularly until a compote is obtained. Allow to cool, then refrigerate. Wash, hull and slice the strawberries. Sprinkle half the strawberries with icing sugar and blend. Heat the milk and agar agar and boil for 2 minutes, stirring, then add the crème fraîche. Pour the mixture onto the blended strawberries. Blend for another 30 seconds. Pour into a bowl and add the reserved strawberry pieces. 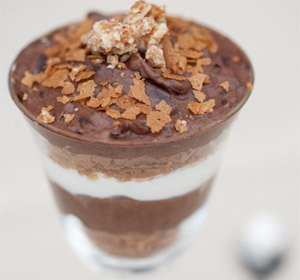 Divide the mousse between small verrines and refrigerate for 2 hours. Place the slightly salted butter in a pan with the pineapple juice and heat until just melted. Cut the filo pastry sheet into pieces of the desired shape with a knife. Brush with melted butter, sprinkle with brown sugar and crumbled Gavottes. Place in the oven to bake for approx 10 minutes at 180°C until lightly browned. Remove the mousse from the refrigerator, cover with the compote and serve with the feuillantines. Enjoy! Mix the yoghurts with the milk in a bowl. 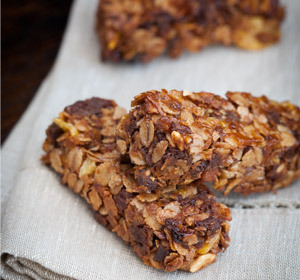 Whisk the egg whites and agave syrup until firm, add the praline and the 9 crumbled Gavottes. Add the whisked egg whites to the yoghurt and milk mixture. Mix well and pour into an ice cream maker. The mixture is quick to set - around 20 minutes. Leave the ice cream to rest for 1 hour in the freezer before serving. Transfer the ice cream to verrines and sprinkle with Gavottes. Suggestion: If you do not have an ice cream maker, prepare the ice cream mixture, place in the freezer and stir every 30 minutes to break up the ice crystals. Mix the softened butter with the sugar, vanilla sugar and salt in a bowl. Beat the mixture to obtain a creamy paste. Add the eggs one by one, mixing well. In a second bowl, mix the flour, ground hazelnuts, Gavottes and baking powder. Gradually add this mixture to the previous mixture. Roll the dough into small sausage-shaped rolls then refrigerate. Preheat the oven to 210°C (th.7). Cut the rolls into slices 5 mm thick. Place them on a baking tray. Bake for around 10 minutes at 180°C. Remove from the oven and transfer the cookies to a rack to cool. Place 50 g slightly salted butter on a plate. Cream the butter with a fork. Separate the eggs and whisk the whites vigorously with the icing sugar until the mixture adheres to the branches of the whisk. Set aside. Mix the chopped hazelnuts and the crumbled Gavottes, add the brown sugar, 20 g of butter, cocoa powder and the creamed butter. Mix well. Gently fold in the egg whites. Grease the interior of 4 individual circles and dust with caster sugar. Place them on a baking tray. Fill the circles with the mixture to 3/4 full. Bake for around 15 minutes at 180°C. Remove from the oven, leave to cool for 5 minutes then unmould by sliding a knife around the edges of the circles. To serve, place the cake on a plate. Sprinkle with icing sugar, bitter cocoa powder and crushed Gavottes. Crumble the Gavottes into a small dish and grind plenty of pepper on top (to taste). Mix. Using a melon baller, make balls of foie gras. Spike onto cocktail sticks or small forks. 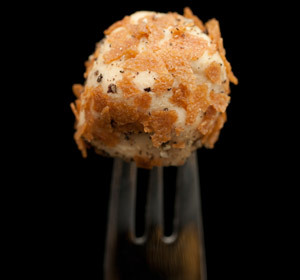 Roll each foie gras ball in the Gavottes-pepper mixture. Place them on a plate, cover with cling wrap and refrigerate for at least 45 minutes. Place the flour, chopped almonds, cubed butter, brown sugar and 10 crushed Gavottes in a bowl. Place the crumble on a baking tray lined with parchment. Bake for 10 to 15 mins. Remove the crumble from the oven and set aside. Pour 5 cl water into a pan, add the chocolate squares and melt over a low heat. Off the heat, add the chestnut cream and mix with a spatula. Allow to cool. Add the remaining crushed Gavottes. Whip the cream into a chantilly. Combine with the previous mixture. Pour the mousse into verrines and refrigerate. To serve, sprinkle the crumble over the verrines. For each mille-feuille, use 9 whole Gavottes. Stick them together in threes using the caramel. Wash and hull the strawberries, cut them in half. Whip the cream into chantilly, adding around 30 g icing sugar, according to taste. 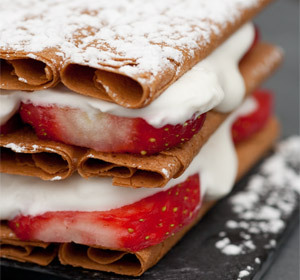 Place the halved strawberries on each stack of 3 Gavottes, then a layer of chantilly. Repeat once, and finish with the final layer of Gavottes. Dust with icing sugar. Beat the eggs in a bowl, then add the sugar, beating all the while. Melt the butter in the microwave and pour onto the mixture. Combine the sifted flour and baking powder. Add to the egg mixture and mix well. Pour the mixture into the paper cases in the muffin tin, to ¾ full. Push the berries delicately into each cake. Bake for approx 15 mins, remove from the oven and leave to cool. To prepare the icing, combine the icing sugar, butter, cream and Gavottes and beat well. Transfer the icing to a piping bag and decorate the cupcakes. Combine the coconut with the sugar in a bowl. Add the melted butter and the 2 eggs, mix well and add the crumbled Gavottes. Line a baking tray with parchment. Form the rochers using a teaspoon or your hands. Make a small hole in each rocher, pour in the caramel then close the hole. Bake for 10 to 15 minutes at 180°C until the rochers are golden. Remove from the oven and leave to cool on a rack. - Wash the apples and cut into 1 cm slices. - Slice the black pudding. - Cut the filo pastry into circles. - Melt 15 g of butter and brush the filo pastry. Season and sprinkle with chilli and pepper. - Bake in the oven until the disks begin to colour. - Melt 25 g butter in a frying pan and cook the apple slices. They must be soft but retain their shape. Keep warm. - Cook the black pudding in the same pan as the apples. 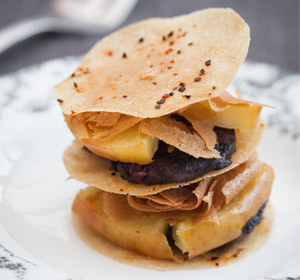 - Build the mille-feuilles with alternating layers of apple, black pudding, Gavottes and filo pastry. Serve with an aperitif or as an appetiser. Suggestion: Vary the recipe by using white pudding. - Peel the asparagus if necessary. Cut the stalks on the slant. Wash and dry. - Beat the egg with a drop of water, pour into a plate. - In a second plate, mix the breadcrumbs, crumbled Gavottes, salt and pepper. 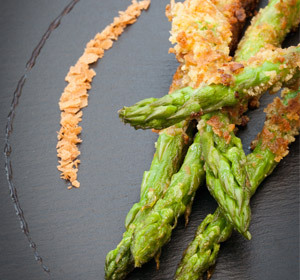 - Dip the asparagus in the beaten egg, then in the Gavottes mixture and repeat. - Heat the oil and butter in a frying pan, add the asparagus and cook quickly until they have coloured (about 2 to 4 mins depending on the thickness). The asparagus should still have some bite. Drain on kitchen paper. Plate up the starter on individual plates, add a drizzle of fruit vinaigrette and garnish with the Gavottes crumble. Eat immediately. 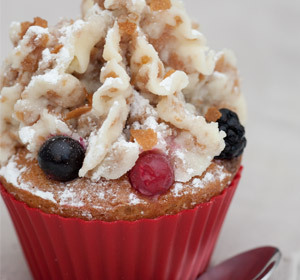 - Crumble the cake in a bowl, add the cream cheese and icing sugar. Mix well. Form small balls (bonbons) from the mixture placing a berry in the centre if you wish. Refrigerate for at least 1 hour. 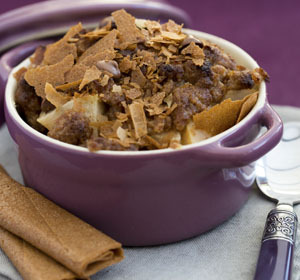 - Melt the chocolate praline in a pan over a bain-marie then add the crumbled Gavottes. Dip the cocktail sticks (or lollipop sticks) in the mixture and fix to the bonbons. Refrigerate the bonbons until the chocolate has set. - Keep the Gavottes/chocolate praline mixture warm. 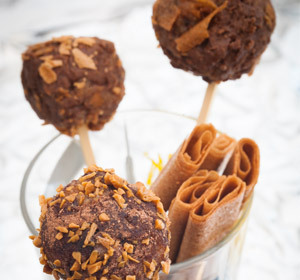 - Dip the Cake Pops into the Gavottes/chocolate praline mixture to coat the bonbons. Decorate with crumbled Gavottes and leave to set. Suggestion: This recipe can also be made using 48 salt caramel demi-crêpe Gavottes. 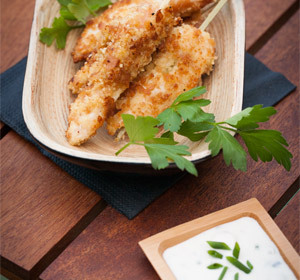 - Cut the chicken breasts into thin strips. - In a bowl, beat the egg with a pinch of salt. Pour the mixture onto a plate. - On a second plate, combine the flour, breadcrumbs, crumbled Gavottes and pepper (chilli pepper optional). Mix. - Coat the pieces of chicken in the beaten egg then in the breadcrumb mixture. Repeat. - Heat the oil and butter in a frying pan, seal the chicken then lower the heat and cook for 5 to 8 minutes. - Wash and chop the chives. - In a bowl, mix the fromage blanc with salt, pepper and chives. - Separate the egg yolks from the whites: put the yolks in a bowl, add the caster sugar whisking continuously until the mixture turns pale. - Mix in the mascarpone. - Whisk the egg whites until stiff. Delicately incorporate the egg whites into the mixture. On the bottom, add a layer of mascarpone, a few raspberries then add another layer. - Garnish the verrines or bowls with a mint leaf and a raspberry. Refrigerate for at least 2 hours. When ready to serve, sprinkle the top with Gavottes and dust with icing sugar. Enjoy! Suggestion: If you prefer, substitute the raspberries with a seasonal fruit. - Break the white chocolate and melt over a bain-marie with 5 cl of double cream. - Whip the remaining 35 cl of double cream. - Once the chocolate has melted, mix into the whipped cream. - Pour into the verrines and leave to set in the fridge for 30 mins. - Break the dark chocolate and put it to melt with the butter in a pan over hot water. - Separate the egg yolks from the whites. - In a bowl, add the egg yolks and whisk in the caster sugar until the mixture turns pale. - Whisk the egg whites with the icing sugar until stiff. - Pour the melted chocolate over the egg yolks, mix well and carefully add the egg whites. - Take the verrines from the fridge, sprinkle with the dark chocolate mixture. - Leave to set for at least 1 hr before serving. When ready to serve, crumble the Gavottes and sprinkle the top with. - Place the butter and dark chocolate in a microwave dish and melt for 2 minutes. Leave to rest for 2 minutes then stir. - Add the brown sugar, then the eggs one by one. Stir. Add the sifted flour and baking powder. - Line a tall-sided, round microwavable dish. - Remove from the microwave and leave to rest for 20 mins before carefully unmolding. Once cooled, cut into 2 or 3 layers of equal thickness. 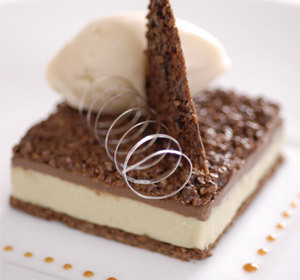 - Melt the chocolate praline, crumble 20 Gavottes, mix well and spread over the layers. - Refrigerate the cake until ready to serve. - Dust the cake with bitter cocoa powder, decorate with pieces of gold leaf and garnish with Gavottes. 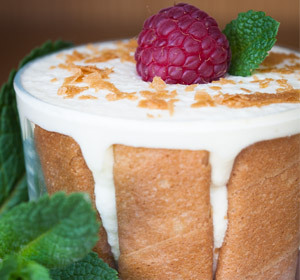 Suggestion : Serve this cake with an English crème. - Préchauffer le four à 180°C (th.6). - Emietter les Gavottes, les disposer dans un saladier avec le muesli et le mélange de fruits secs. - Verser l’huile, le beurre fondu, le miel. Bien mélanger et ajouter les pépites de chocolat. - Tasser fermement la préparation dans des petits moules à cake. - Sortir les moules du four et laisser reposer avant de les démouler. Suggestion : vous pouvez saupoudrer les barres de céréales de sucre glace. - Melt the chocolate praline and the dark chocolate together in a pan over a bain-marie. Stir. - Line a baking tray with parchment paper. Form the discs using a teaspoon. Delicately sprinkle with the crumbled Gavottes, pistachios and cranberries. - Leave to set in a cool, dry place. - Preheat the oven at 180°C. - In a blender, mix the flour, baking powder, brown sugar and eggs. 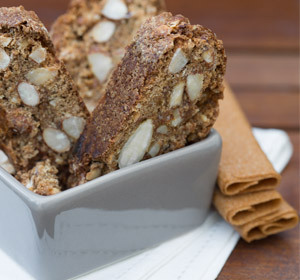 - Add the crumbled Gavottes and almonds. - Mix well until the dough reaches an even consistency. - Shape the dough into 2 rolls and place on a baking tray lined with parchment paper. - Melt the butter with the milk and brush over the dough. - Bake for about 1 hr. Remove from the oven and slice immediately before the rolls become dry out. - Preheat the oven at 150°C. - In a bowl, mix the baking powder, flour and crumbled Gavottes. - In another bowl, place the egg yolks and add the sugar whisking continuously until the mixture turns pale. Add the melted butter. - Add the flour/Gavottes mixture and stir. - Place a small amount of dough in half-moon-shaped silicone moulds; each should be about 5 mm thick. - Place some parchment paper onto each biscuit base and weigh down (ceramic baking beans, dry beans, etc). - Bake for 20 to 25 mins. - Remove from the oven, leave to cool before unmolding and top with lemon curd. - In a saucepan, melt the sugar in the water, mix and leave to cool. - Add the lemon juice and finely pureed bananas and mix with the syrup. - Place in the ice cream maker. In a bowl, beat the egg yolks with the sugar until the mixture becomes white. - Melt the gelatin in the warm milk and pour over the mixture of eggs and sugar. - Beat to produce a uniform liquid. - Pour the preparation over the broken chocolate and leave to melt over a low heat. - Leave to cool. Whip the cream, add salt and icing sugar. Whip again and add the first preparation. - Pour into a mould and place in the fridge. Soften the sheets of gelatin. - Puree the avocados in a food mixer. Add the lemon juice. - Strain the gelatin and microwave for 30 seconds. - Add the gelatin and syrup to the avocado and blend. Whip the cream. Add the icing sugar and beat until the mixture takes on a shiny appearance. - Gradually add the whipped cream. Pour the preparation over the chocolate bavarois and place the mould in the fridge. - When the preparation is uniform, add the broken Gavottes away from the heat. - Mix then spread finely between two sheets of baking paper. - Keep cool for one hour then cut with a knife. 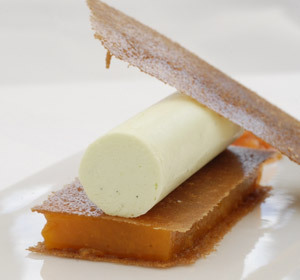 - To serve, remove the bavarois from the mould onto the biscuit base. Arrange on the plate adding a scoop of banana sorbet. Ramollir le beurre en beurre pommade. Ajouter le sucer, puis les jaunes d’oeufs et enfin la farine. Mélanger et étaler sur du papier sulfurisé. Cuire à 180° de 30 à 40 minutes et détailler des cercles à l’emporte-pièce. Cuire le sucre et l’eau a 185°. Hors du feu, ajouter le beurre et mélanger. Ajouter ensuite la crème chaude et mélanger. Passer au chinois. Mouler la sauce (à défaut de tubes ou moules spécifiques, il est possible de couler le caramel dans des moules à glaçon à la forme désirée) et réserver au congélateur. Chauffer la crème et le beurre. Ajouter la gélatine. Verser le tout sur le chocolat en morceau. Incorporez la crème montée délicatement. Mouler en cercle afin d’incorporer la sauce caramel. Réserver au congélateur. 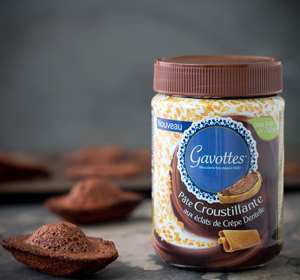 Faire fonde le chocolat blanc et mélanger avec les Gavottes. Etaler sur du papier sulfurisé (ou sur une feuille alimentaire imprimée) et détailler des cercles à l’importe pièce. Faire fondre le glucose avec un peu de lait ribot. Réaliser un sirop à sorbet avec le sucre, l’eau et le stabilisateur. Mélanger tous les éléments. Passer au chinois, réserver 12 heures au réfrigérateur. - Heat the isomalt and add the broken Gavottes. Stir with a spatula and leave to cool on a silicone sheet, then grind in a food mixer. - Make a 10cm x 3cm rectangular hollow and sprinkle the contents obtained in this shape (on a sheet of baking paper) making 3 (very thin) rectangles per person. - Bake at 170 °C until light golden and cool. - Wash and stone the apricots; keep one to cut into raw squares for the garnish. Break the stones to remove the kernel and add to the apricot segments. - Add sugar and cook with a lid for 5 minutes, then bind with the agar agar and pour into a rectangular mould (so as to be able to cut slivers into the preparation at a later stage). Leave to cool. - Cream the egg yolks with the sugar. - Add the cornflour and pour the boiling cream infused with basil and mix. - Cook as for a custard sauce then add to the gelatin (previously softened) and blend. - Pass through a chinois sieve and cool. - Finally, add the whipped cream and leave to set in the fridge. 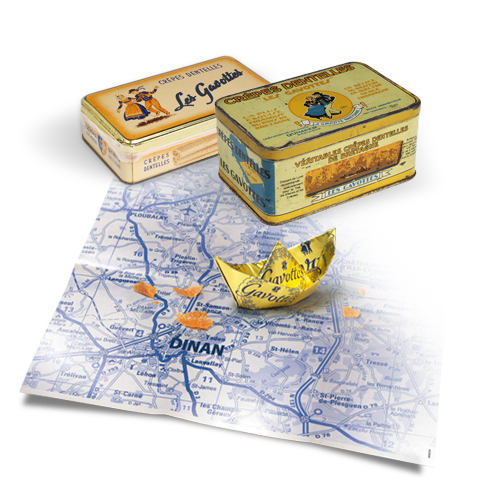 - Arrange a slice of Croq’Gavottes on a plate and cut a slice of apricot pastry. - Add another slice of Croq’Gavottes. - Using a piping bag (with a large nozzle) arrange the basil cream lengthwise. - Add a final slice of Croq’Gavottes. Add the apricot salad (finely diced) seasoned with basil and olive oil. Faire fondre au bain-marie le chocolat et la pâte à tartiner et verser dans des petits moules à sucettes (ou autres moules en silicone pouvant faire office de moule). Réserver au congélateur. Laver et équeuter les fraises, en couper 800 gr en 2 et mettre dans un saladier avec 30 gr de sucre, 3 feuilles des basilic et ¼ de gousse de vanille et couvrir d’un film plastique de façon émétique et réserver une heure. Cuire en suite au bain-marie à feu moyen pendant 20 min environ. Filtrer le jus de fraises obtenu et en chauffer environ 2 dl avec de la gélatine ramollie u préalable. Verser dans un plat d’un centimètre et demi de profondeur et placer au réfrigérateur pendant 3 à 4 heures. Assembler le millefeuille en alternant (comme sur la photo) les 3 gavottes, la gelé de fraises et les fraises restantes coupées en deux et légèrement sucrées. Mélanger le ½ litre de lait, les 5 jaunes d’œufs, 100 gr de sucre et ½ gousse de vanille (pour obtenir la crème pâtissière).Cuire la crème pâtissière, ajouter le grué et le praliné en fin de cuisson. Sur une plaque, à l’aide d’une poche, former 4 cylindres réguliers. Passer au congélateur pendant quelques heures. Une fois sortis, badigeonner les cylindres de chocolat puis les rouler dans les brisures de Gavottes. Réserver au frais. 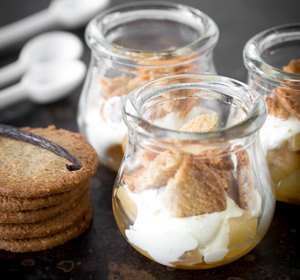 Infuser tout simplement les amandes dans le lait sucré, vanillé. 30 minutes plus tard, passer au chinois, porter à ébullition, puis ajouter la maïzena. Réserver au frais. Mélanger le beurre, la farine, et le sucre, puis les œufs. Malaxer jusqu’à l’obtention d’une pâte homogène. Abaisser le plus fin possible, détailler la forme souhaitée et cuire à 175°C pendant 8 minutes. - Add the Gavottes (broken into pieces). - Spread the preparation to a depth of 3mm on a sheet of baking paper. - Soak the gelatin in cold water. - Boil the milk, add the gelatin and pour over the chocolate. - Stir from the middle outwards. - Whip the sweet cream (not too stiff). Using a spatula, gently incorporate the chocolate into the whipped cream. 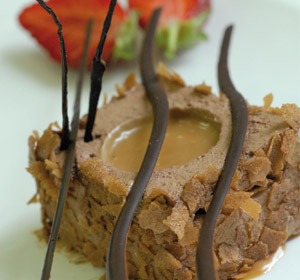 - Pour into a dome-shaped mould with the chocolate mousse. - Add the fresh raspberries and cover them with mousse. Place in the freezer and keep for one day. - Take the biscuit base and cut a circle the size of the dome. - Remove the entremets from the freezer 1/2 hour beforehand. - Remove the entremets from the mould and place on the biscuit base. 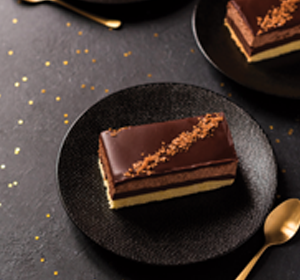 Coat the entremets with Gavottes. 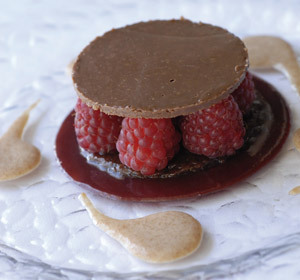 Arrange the chocolate dome on a plate on a raspberry coulis applied with a brush. 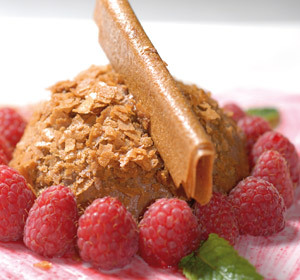 - Surround the entremets with raspberries and decorate with one or two mint leaves and a Gavottes crepe dentelle. Dans un bol à mixeur, mélanger les fruits rouges, le yaourt, la menthe et mixer fortement. Réserver au frais avant d servir. Couper 8 grosses fraises en deux dans la longueur, disposez-les à plat par 4 moitiés coté à coté pour pouvoir les relier en brochette. Les transpercer d’un pique en bois. Les tremper coté plat dans un œuf battu avec un peu de sucre et de vanille « ouverte ». Briser les Gavottes dans une assiette plate et venir appliquer une légère pression aux brochettes pour bien coller les éclats de Gavottes aux fraises. Dans une poêle, avec un peu de beurre, dorer les brochettes 30 secondes pour former une belle croûte sur les fraises. - Boil the pulp with the trimoline. - Pour over the chocolate. Stir to make a smooth ganache. - Add the butter in pieces and the raspberry liqueur. - Stir together to form a smooth paste. Melt the cocoa butter with the milk chocolate, heating to a temperature of 45 °C. - Add the hazelnut praline and 5g Guérande salt. - Incorporate the broken Gavottes. - Mix then spread finely between two sheets of baking paper. Flatten with a rolling pin to form a thin crispy base. - Form the required shape and leave to set for one hour in a cool place. - Combine the muscovado and raspberry vinegar and bring to the boil. - Reduce to 2/3. Season the raspberries with a drizzle of olive oil, the vinegar reduction and pepper. - Combine the syrup, raspberries, vinegar and agar agar. - Bring to the boil, mixing with a whisk, then pour onto a baking tray with raised edges. - Leave to set in a cool place, then cut into pieces. - Assemble the crepes dentelle crisp, raspberry compression and crepes dentelle crisp in stainless holders, then the ganache. - Leave in the fridge for 6 hours. - Take out the preparation 20 minutes before arranging the raspberry salad on the cake. Au robot, mixer grossièrement les Gavottes & le pralin. Ajouter le chocolat fondu et mélanger. Etaler ensuite la pâte entre deux feuilles de papier sulfurisé, et mettre au froid 20 minutes. Mouler dans un cercle ou dans un plat à tarte. Réaliser une crème anglaise avec le lait, le sucre et le jaune. Passer au chinois, et ajouter dans un récipient le chocolat noir. Laisser refroidir. Couler la préparation chocolat sur votre pâte et laisser refroidir, de 4 à 5 heures. Fondre le beurre sur feu doux. 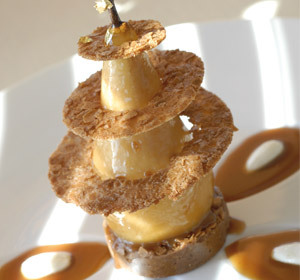 A l’aide d’une spatule en bois, mélanger dans un saladier la farine, le sucre, les blancs d’œufs, et une larme de vanille. Verser le beurre encore chaud sur la préparation obtenue et mélanger. Ajouter au dernier moment les Gavottes (en brisures) et mélanger délicatement pour les briser le moins possible. Couvrir d’un film alimentaire. Sur une plaque de cuisson antiadhésive, faire des tas de pâte de la valeur de 2 cuillères à soupe en les espaçant. Les aplatir finement à l’aide d’une fourchette trempée dans de l’eau froide. Préchauffer le four a 170° Cuire les tuiles environ 15 minutes jusqu’à ce qu’elles soient bien dorées. Lorsqu’elles sont encore chaudes, les modeler en les glissant dans un bol ou un moule à brioche pour en épouser la forme. 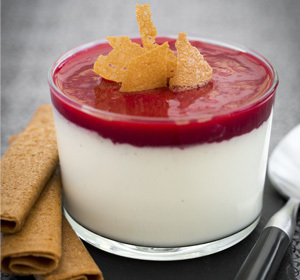 Détendre la crème pâtissière avec la Chantilly, parfumer de quelques gouttes d’eau de vie de framboises. Garnir les tuiles de crème allégée et disposer les fruits de votre convenance dessus. Dans une poêle, avec une noisette de beurre, rouler les cerises légèrement saupoudrées de sucre. Servir les cerises chaudes à coté. Astuce : ces corolles peuvent se garnir de fruits frais de chaque saison. Chauffer le fondant et le glucose. Avant ébullition, sortir la préparation et y incorporer les brisures de Gavottes. Etaler sur une plaque silicone (ou papier sulfurisé) pour refroidir. Faire des découpes au couteau et étaler la forme désirée à nouveau sur la plaque de silicone et passer au four 2/3 minutes à 160°. Rouler pour obtenir la forme définitive. Fouetter les œufs avec le sucre, la poudre à flan. Incorporer le lait et la verveine. Faire bouillir pendant 5 minutes. Hors du feu, ajouter le beurre et la gélatine et mélanger. Pour le sirop de base qui doit être incorporé : Mélanger l’ensemble des ingrédients puis faire bouillir 10 minutes afin d’obtenir le sirop. Ensuite, dénoyauter les cerises et les mixer avec le sirop, le tandoori et le poivre. Faire bouillir puis passer en sorbetière. A l’aide d’une poche à douille, garnir le tube de Gavottes craquant ( la tuile « Gavottine ») de crème verveine. Disposer dessus des lamelles de cerises et des fines découpes de feuilles de menthe. Servir le sorbet à coté. Certains ingrédients de cette recette sont souvent destinés au professionnels : vous pouvez les retrouver dans des sites Internet spécialisés ou dans des magasins destinés aux professionnels de la restauration. Faire fondre au bain marie la pâte de cacao, le chocolat et le beurre doux. Mélanger, réserver. Chauffer à feux doux l’eau et le sucre, puis incorporer les jaunes d’œufs et battre vivement au fouet électrique ou manuellement jusqu'à l’obtention d’une mousse compacte et froide. Incorporer 25 gr de sucre et la poudre de cacao (la base 3) à la base 1. Puis, à froid, incorporer la base 2 au 1 et 3 et mélanger. Terminer délicatement avec la crème fouettée. Chemiser dans des cercles, tube ou autre forme à votre goût puis réserver au froid pendant 2 heures. Monter la crème fouettée. L’incorporer à l’aide d’un fouet dans le chocolat tiède, mais surtout pas chaud. Dans des cercles inox (ou a défaut des pots de yaourt), monter en couches successives la mousse chocolat et les brisures de Gavottes. Réserver au réfrigérateur environ 1 heure. Dans une petite casserole, cuire sans eau le sucre. Une fois blond, incorporer le beurre coupé en petits morceaux et verser dessus le 50 gr de crème. Porter à ébullition et réserver au frais. Sortir les mousses du réfrigérateur et patienter quelques instants. Démouler les mousses au chocolat. A l’aide d’un vide pomme (ou mieux d’une cuillère à boules), évider le centre des mousses. Rouler les mousses chocolat dans les Gavottes (en brisure), disposez les sur les assiettes et couler dans la cavité du centre le caramel au beurre salé. Décorer le dessus de fraises. Pour dresser, vous pouvez rajouter un filet de sauce caramel sur l’assiette. Mélanger la poudre d’amandes avec le sucre glace puis réserver cette préparation. Dans une petite casserole, porter le sucre et l’eau à une température de 118° C. Verser en suite le contenu de la casserole sur les blancs préalablement montés en neige. Ajouter le colorant et laisser tourner 5 minutes. Incorporer le mélange amandes et sucre glace, mélanger délicatement. Dresser sur plaque et laisser reposer à l’air libre 30 minutes. Puis cuire au four 10 minutes à 190°C. Mélanger la crème fouettée au mascarpone et y ajouter le zeste de citron. 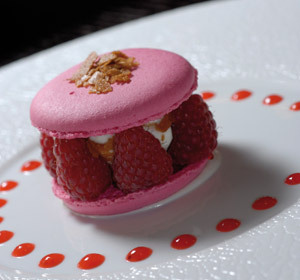 Sur une coque a macarons, ranger les framboises en cercle, au centre garnir de crème légère, parsemer la crème d’éclats de Gavottes. Assembler le tout avec une autre coque à macaron. Déposer sur une assiette et servir le tout avec un coulis de framboises sans sucre. Faire un caramel à sec. Ajouter de l’eau chaude pour décuire et réduire à consistance. Ajouter le cacao en poudre. Mixer avec les myrtilles. Peser autant de crème que de chocolat. Faire chauffer la crème et verser sur le chocolat. Mélanger, laisser refroidir et ajouter les Gavottes jusqu’à ce que le mélange soit friable. Mouler puis laisser durcir au frais. Démouler. Brûler les poivrons au grill et enlever la peau. Les couper en oreillons et les disposer dans une plaque, ajouter les cerises, le gingembre en morceaux, la citronnelle, le thym, des graines de coriandre et une pointe de sel. Arroser de vinaigre de framboise et recouvrir d’huile d’olive. Couvrir et confire à 80°c pendant une heure. Laisser refroidir et tailler en lamelles. 250g sheep's curd (full fat raw sheep's milk). - Melt the chocolate over a pan of boiling water and mix with the Gavottes (broken beforehand). Spread out on a baking tray (on a sheet of baking paper). Cut pieces with a pastry cutter (or with a knife). - Remove the lime zest and juice. Mix the zest and juice with the honey. Leave the strawberries to marinate for 30 minutes and strain before use. - Mix the sheep's curd with the cream and 50g of sugar. Place in the ice cream maker. 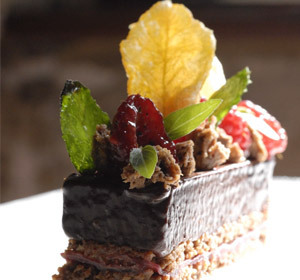 - Begin by arranging a layer of chocolate and Gavottes. Place the rhubarb on top. 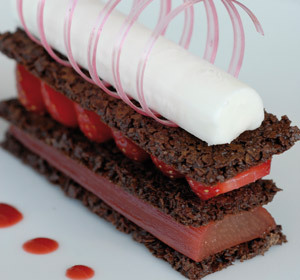 Place the layer of chocolate- Gavotte mix on top and then arrange the marinated strawberries. Add another chocolate and Gavotte slice. Complete with the sheep's curd sorbet previously moulded in a tube. 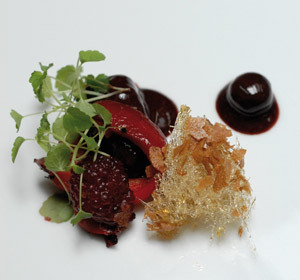 If preferred, the sheep's curd sorbet may be replaced with faisselle cream cheese or another sorbet of your choice appropriate for this recipe. Mixer 10 crêpes dentelle Gavottes avec 120 gr de lait entier. Faire fondre 100 gr de chocolat au lait et 25 gr de beurre puis ajouter 10 crêpes dentelle en brisures. Etaler en suite finement sur du papier sulfurisé entre 2 feuilles, laisser refroidir et réserver une dizaine de minutes au réfrigérateur. A la sortie du réfrigérateur, détailler des cercles à l’importe pièce. Faire fondre 60 gr de chocolat au lait. Une fois fondu, y ajouter 240 gr de praliné noisette et 24 Gavottes brisées. Etaler finement sur du papier sulfurisé entre 2 feuilles. Attendre quelques minutes et placer au réfrigérateur 30 minutes environ. Réaliser les découpes à l’emporte-pièce. Verser le caramel de fruits rouges sur l’assiette. Apposer par-dessus la tuile de crêpes dentelle. Dresser les framboises fraîches au centre puis recouvrir du disque de crêpes dentelle au chocolat. Chauffer (torréfier) les fruits secs au four à 160° pendant 8 minutes. Réaliser un caramel blond avec l’eau et le sucre, ajouter les fruits secs torréfiés ; Mélanger à la spatule et réserver dans un plat anti-adhésif. Une fois refroidi, broyer le tout au robot jusqu’à l’obtention d’une pâte épaisse et granuleuse. Y ajouter le chocolat fondu au bain marie et les Gavottes concassées. Mouler dans des cercles de 7 cm de diamètre. Réserver au frais. Mélanger tous les ingrédients et étaler au rouleau sur un silpat (plaque de silicone). Cuire à 160° jusqu’à coloration et détailler les disques à l’importe pièce au diamètre de la poire. Réserver au sec. Réaliser un caramel blond avec l’eau et le sucre. Hors du feu, verser peu à peu la crème chaude tout en mélangeant au fouet. Remettre à chauffer et ajouter le beurre. Débarrasser la sauce dans un plat dans lequel vous disposerez vos poires. Eplucher et vider les poires par le dessous à l’aide d’une boule Parisienne. Cuire au four pendant 20 min à 180° en arrosant des poires de temps à autre. Dans un four à 180°, réchauffer les poires au caramel, pendant 5 min avant de les servir. Sur l’assiette, poser le disque de praliné Gavottes et placer la poire chaude par-dessus, y ajouter les tuiles craquantes. Faire réduire le café liquide et le sucre en poudre jusqu’à l’obtention d’un sirop. Monter la crème liquide en chantilly pas trop serrée. 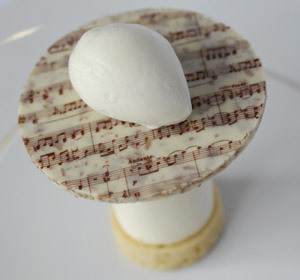 Fouetter le mascarpone pour l’assouplir et incorporer la chantilly à la spatule et la moitié de votre réduction de café. Emietter les Gavottes. Concasser finement les grains de café et saupoudrer sur le dessus. Ajouter le reste de réduction de café sur le dessus et décorer d’une crêpe dentelle Gavottes ou d’un biscuit de votre choix. En remplissant cette case avec votre adresse mail, vous acceptez que Loc Maria Biscuits la collecte et l’utilise dans le but de vous envoyer des lettres d’informations que vous acceptez de recevoir, en accord avec notre politique de protection des données. Vous pourrez à tout moment vous désinscrire en cliquant sur le lien de désinscription présent dans chacune de nos newsletters. En tant que responsable du traitement réalisé sur vos données personnelles, Loc Maria Biscuits collecte et traite vos données à caractère personnel dans le but de répondre à vos demandes de contact.